Have you been looking for that special pentagram pendant that has YOU written all over it? I offer a good variety of unique Wicca and Pagan pentagrams that tell others about your path. I feel it is important to wear a pentagram proudly. It lets other Pagans and Wiccans know that you are one of them. It also lets the public know that we are everywhere and our beliefs are acceptable. It gives you the opportunity to educate others when they ask about your Pagan pentagram jewelry and to set the record straight about the true meaning of the pentagram. Please, wear your pentacle proudly. When you hide it, you say that there is something unacceptable about your beliefs. If you are ready to proudly display your pentagram, you can order online below or call. The pentagram stands for spirit ruling the world of matter... also life, health, protection (especially against hostile spirits)... also as a human being as a microcosm of the universe. The points can represent the 5 senses, stages of life or states of consciousness. Small silver ones are favored by witches as amulets. If inverted, it can represent the horned god or spirit hidden in matter or subject to it. There is no Satan in the pentagram. 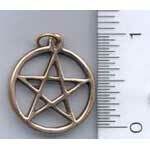 Please note that I also carry pentagram pendants that have Wiccan spells inscribed on them. They are on the magic amulet page. 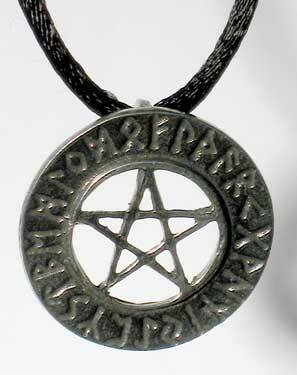 This pewter open pentagram pendant has the futhark runes carved around the outer rim.